Last edited by Davydd on October 11th, 2006, 7:16 pm, edited 2 times in total. Most of my pursuits so far have taken place in and around Minneapolis/St. Paul and in Indiana every May leading up to the Indy 500. This weekend we are going to chase the fall colors down the Mississippi River and into Iowa. Our pursuit may end up in St. Olaf, Iowa at the Tavern where they claim to have the biggest breaded pork tenderloin sandwich in Iowa. We will see. We have already been to Joensy's in Solon, IA where they claim to be the biggest and best. The St. Olaf Tavern is also number 87 on the Des Moines Register's list of 100 places to eat in Iowa before you die. I believe I've had the pork tenderloin at the Tavern in St. Olaf, if so it was very good. If you go, check for the appetizer of deep-fried little nuggets of creamed corn, they're suprisingly good. In Chicago, you might seek out the German places that serve schnitzel sandwiches. Get back to the proto-pork loin sammy. Start at Resi's. There used to be a lot of German places, bar restaurants, that served a pork tenderloin sandwich. Most have closed. Several didn't even bother to call it schnitzel, just called it pork tenderloin. Two particularly good ones were on Southport just south of Addison, west side of the street (they had a killer German potato salad). Also on Damen just north of Addison I believe, perhaps Roscoe, west side of the street. 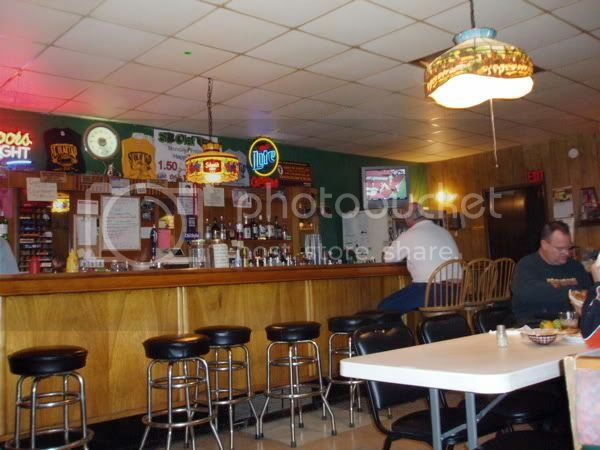 That place had a gorgeous wooden bar, which is still in the current establishment. While these places served dinners, they were really more sandwich places, and that's how I always had my pork tenderloin, which was generally my pick off the menu. Yes, the Polish places. Every morning that I step into Andy's on Division for water and an apple, I see the tray of great looking freshly-fried breaded pork (and the sausage, pierogi, etc.). Some day I've got to take a seat with the construction workers and have a massive Polish meal for breakfast. Anything made from pork at Andy's is good; when they bread it and fry it in butter, well. Yes, there are variations around town if you change your perspective. Just yesterday, I had another delicious meal at Zascianek. Of course, as typical, I had my pork cutlet topped with potato pancake and then smothered in cheese and gravy (the contractor), but the plain pork cutlet is plenty good here as well. For takeout, I really love the store on Harlem just north of Grand, whose name just escapes me it's like Kolocek but I'm not sure. They always have pork and chicken cutlets, but this place is filled with treats ranging from massive cheese pastries to house made soups. They also sell natural Amish chickens for an unbelievable price of $1.59/lb and have the most excellent Amish milk from Iowa. Another thought is Freddy's. Pork cutlets are nearly always there. It's a different experience because the sandwich gets soggy from the gravy. Still, it is one my favorite things to get there, and what I often end up with when blown away by the choices. Ceres Restaurant in the Board of Trade Building has good pork tenderloin. I am not sure if they will serve it as a sandwich, but you get 2 huge pieces of pork tenderloin, mashed potatoes that are good with gravy on both. Its served with a side dish, their mixed vegetables are good and still al dente. I think they also have it in the cafeteria below. This wasn't a discussion about pork cutlets and dinners. This is really about the Midwest oriented deep fried breaded pork tenderloin sandwich. Maybe this will help and juice your taste buds. We traveled to northeast Iowa for one last camping trip at Pike's Peak State Park overlooking the Mississippi River. As it turned out the fall colors had already peaked and it was very, very cold. For two days it never got above 40. We cooked breakfast over a campfire in 29 degree weather. 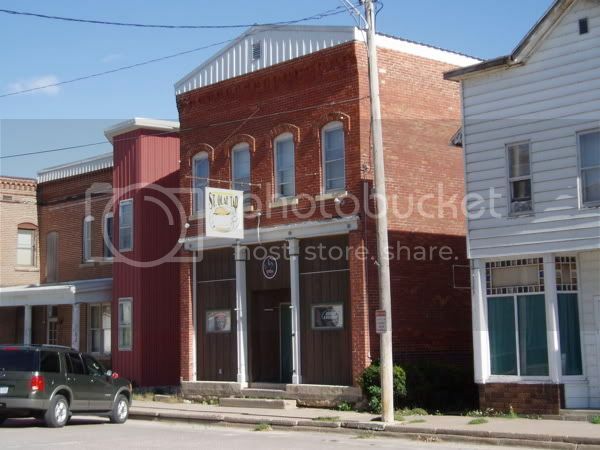 We endured because the overriding goal was to seek out the World's Largest Tenderloin" and we may have found it at the St. Olaf Tap in the "Little Switzerland" village of St. Olaf, Iowa. St. Olaf is in the middle of nowhere. You go by turning off US 52 onto state highway 13 and driving until you see a sign that says "St. Olaf 2 miles, home of the world's largest tenderloin". You arrive by coming over the crest of a hill and seeing the whole of St. Olaf in a valley. The Tap was very easy to find on Main Street. The Tap was very busy at 1:30 in the afternoon. Every table was taken so we took stools at the bar and placed our order. Your choices were the Pork Tenderloin at 16 oz., the Medium Tenderloin at 8 oz. or the Mini Tenderloin at 4 oz. The medium tenderloin is about what most restaurants serve. The mini tenderloin fills the bun. So we waited with our Honey Weiss Leinenkugels and finally a table opened up for us. In waiting we struck up a conversation with Tim Lusthoff, the proprietor. Ever since the Des Moines Register came out with the article, "100 Places in Iowa you have to eat at before you die" they have been very busy. The week before they ran out of tenderloins. Their tenderloins are made from fresh pork trimmed of fat, hand breaded and fried in soy bean oil. Was it the world's largest? Possibly. It was definitely the largest we ever had and it was considerably larger than Joensy's in Solon, IA, the claimant of the "Biggest and Best". How good was it? Very good and surprisingly, even though it filled the dinner plate, it was not paper thin and dry. It was thick and juicy. It was worth the trip for us. We were not disappointed. You speak of midwestern breaded pork, and then jump right into "Little Switzerland," Weiss Leinenkugels, and Mr. Lusthoff. Yeah, schnitzel's too tenuously connected to be part of this discussion. Whence do you suppose the pounded, breaded and fried cutlet of Indy and Iowa? The best I can offer as to the origination of the Midwest breaded pork tenderloin sandwich is Nick's Kitchen in Huntington, IN. Until someone comes up with better documentation this is the version I go with. This is Beyond Chicagoland where you are going to find them big, simple and usually served with a bun. 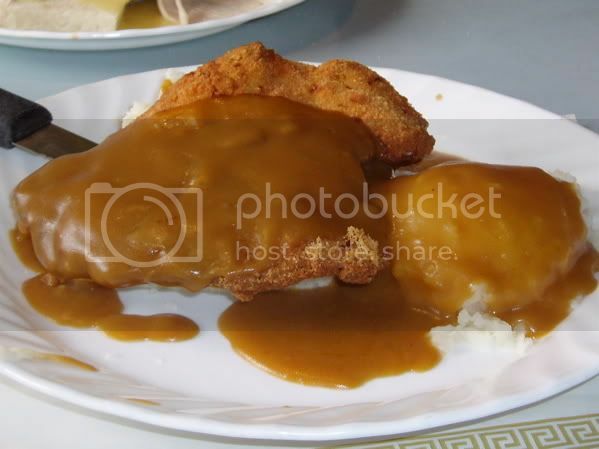 Chicago does have its own tradition and gravy slathered versions, usually open faced if called a sandwich and may be still closer to its German/Viennese derivation of the wiener schnitzel. 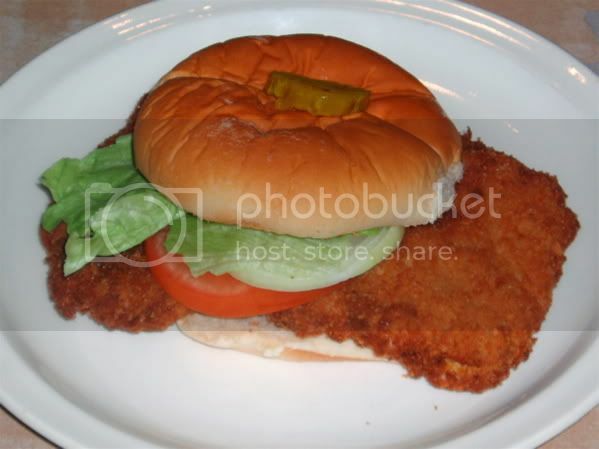 Davydd wrote: The best I can offer as to the origination of the Midwest breaded pork tenderloin sandwich is Nick's Kitchen in Huntington, IN. 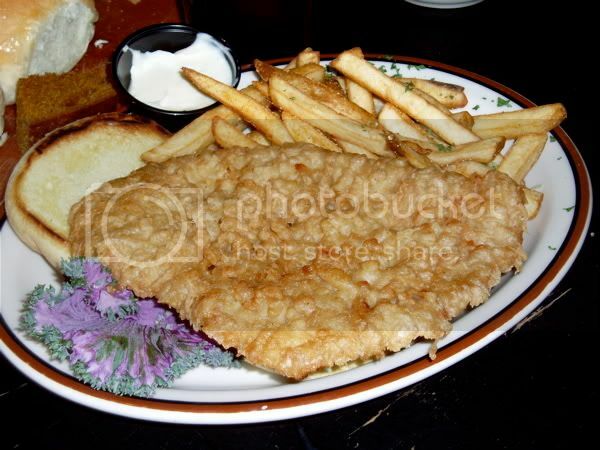 JeffB's point was that the pounded, breaded and fried slice of pork is something pretty basic in German cuisine and its presence in the Midwest, where lots of Germans settled (incl. Indiana and Iowa), is most likely a reflection of German tradition. That seems pretty logical and right to me. Restaurants' claims to have invented basic dishes like this usually strike me as being funny. And putting a pork schnitzel on a bun isn't all that much invention (as I mentioned above, I had exactly that in Germany last month). Maybe Nick's has some particular twists on the dish that are original but then the quesion is whether they are shared across the Midwest; that the dish in any meaningful sense must be traced specifically back from throughout the Midwest to Nick's or any other one restaurant strikes me as unlikely -- clearly there were lots of Germans around who had been eating these things in the old country and surely more than one opened a restaurant and served pork schnitzels. On the other hand, it is, of course, a regional dish in the Midwest, with its own secondary developments, and there surely was some influence from restaurant to restaurant, town to town, and perhaps a gradual development of a regional style of serving what had once been just an old pork schnitzel. And, of course, do note that Nick's kitchen's owner sported a rather German family name: Freienstein. Nick Freinstein in Huntington, IN originally sold what he called veal sandwiches which are the direct derivative of weiner schnitzel. At some time they became pork but that is lost in history. Maybe they were never veal at all. The German settlers in northeastern Indiana were for the most part the Pennsylvania Dutch (Deutshe) from Colonial America times. I know this because I have ancestral lines through this area in Deahl (Diehl) and Rice (Reiss) that came to America in the 1730's from Germany and I have poured over census records and studied migration patterns. Those settlers by the time they reached Indiana were several generations American with only hints of German traditions. It is amazing how influenced we remain even after generations and all sense of history is lost. Read Albion's Seed, Four British Folkways in America, by David Hackett Fischer to understand this. 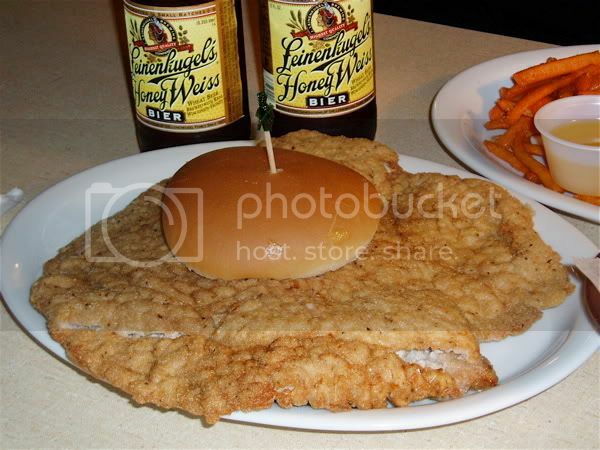 The breaded pork tenderloin sandwich that is recognized through most of the Midwest primarily Indiana, Iowa and rural Illinois is not considered a German food of recent German derivation. Most restaurants that serve them have no German ties or other German menu items. 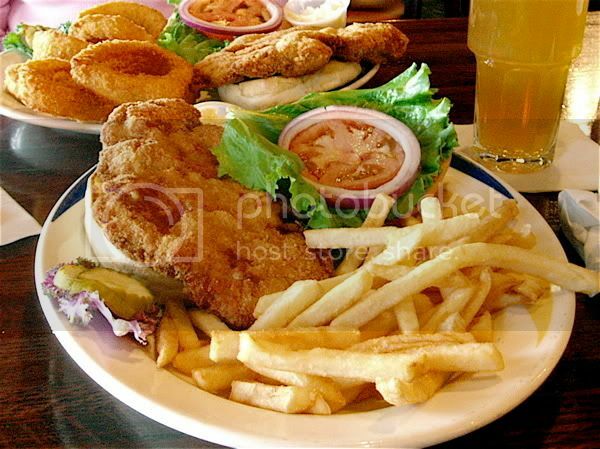 The breaded pork tenderloin sandwich can usually be found at drive ins, bowling alley restaurants, small bars and independent family restaurants. In Indiana they are making inroads into Sports Bars and the yuppie fern bar restaurants, or just about any restaurant that serves sandwiches. It is becoming an Indiana must have in those places. In and around Chicago it is different as witnessed by the New Archview Restaurant, Petros, and the Crystal Bohemian Restaurant in Westmont. Their style is probably more related to recent German influence and probably from the German immigrants of the 19th Century and later. The New Archview and Petros called them sandwiches but served them open face on top of two slices of white bread with the crust trimmed off all slathered in gravy. If it comes with a bun, pickle and mustard then it is a Midwestern sandwich and if found outside of the Heartland in this form you will more than likely find an expatriate Iowan or Hoosier in the kitchen like the Iowa Cafe in Mesa, AZ and the Hash House A Go Go in Las Vegas and San Diego (Hoosier). As a clarification about St. Olaf, the Little Switzerland reference is tourist promo because of the town sitting in a valley that gives it a picturous appeal. The current proprietor took over a little over a year ago and its pork tenderloin tradition only goes back about 15 years from what I understood. There was not a hint of German influence in the place. It reeked of a small town farmer's watering hole--real Americana. As for the Leinenkugel's what beer is not German? It's a Wisconsin brew and a better choice than Busch Lite on tap. 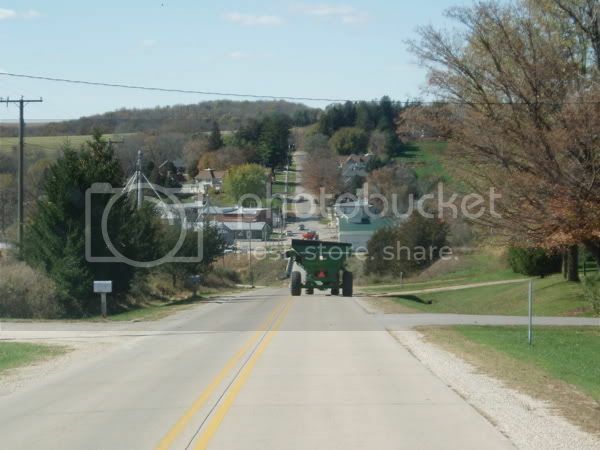 Since this is Beyond Chicago Land I still contend the discussion is not German but good ol' Heartland Americana. Interesting stuff. But it is beyond debate that the Midwest, and certainly the agreed pounded pork loin hotspots of Indy and Iowa were and are heavily German-American. Google 'Indianapolis' and 'German,' and up comes an unsurprising history of Indy's (and Cincinnati's) German connection. From IUPUI, in fact. So maybe pounded, breaded pork loin is not remembered as German in the drive-ins and bowling alleys of Des Moines and Carmel. Maybe if they were called something more German-sounding, like, um, hamburgers, frankfurters, or pretzels, the connection would seem less speculative. I'd venture that plenty of pizza is served in the same towns, but not necessarily by Italians. (Apparently, only Chinese-Americans have a lock on selling their own food, no matter where, no matter how bad, and no matter how Americanized.) Many here might agree that the various Midwestern sorts of pizza, from Starback to Imo, are much less Italian than a schnitzel on a bun is German, but few would deny the Italian influence, indeed even the muddied, possibly debasing, but ultimately direct genealogy. Anyway, none of this is meant to diminish the remarkable documentary you are creating, and I will be sure to take a look at your list before hitting the road. I love, pounded, breaded pork, whatever it's called. And I like the bars where they are served. Really, you should try Resi's. It sure looks like it was decorated by the same guy who did the bar with the world's largest breaded pork loin. P.S., the Bohemian place in Westmont is, well, Bohemian, though I'm not sure how different the schnitzel of of Prague is from that found across the border. And the point about Leinie's is exactly what you suggest, except more narrow -- what Midwestern beer made by a German American familiy isn't sort of German. I am certainly enjoying them. This whole pursuit got started in March '05 when I was home sick one day and flipping through the cable TV channels and landed on a Food Network show featuring the making of the breaded pork tenderloin sandwich at the Brickyard Crossing Restaurant at the Indianapolis Motor Speedway. That got my attention. The restaurant was in the first building I ever worked on in an architect's office, was in my home town and I probably hadn't eaten a breaded pork tenderloin sandwich in all the years I had lived in Minnesota. Landing on that episode was kind of like an epiphany. So why not pursue them? It is kind of a fun hobby. I think the breaded pork tenderloin sandwich is considerably more popular now in Indiana and Iowa than they were in the 60s. It has kind of become a pride thing in both states though Iowa has its loosemeat sandwich to fall back on. JeffB wrote: Google 'Indianapolis' and 'German,' and up comes an unsurprising history of Indy's (and Cincinnati's) German connection. From IUPUI, in fact. Interesting article Jeff. In growing up I never thought of Indianapolis as being strongly German. Mainly because I lived in a community that was more English, Scots, Irish American from generations that came through Virginia and Kentucky (as did my fraternal ancestry). My maternal ancestry came via Pennsylvania, Ohio and northern Indiana (Ft. Wayne) and would have been Pennsylvania Dutch descendancy. I went to college in Cincinnati and that city was very dominatingly German right down to a nasal twang and saying, "Please?" for "What?" --a German idiom in English translated from "Bitte". And, of course, a lot of German breweries that Indianapolis never had. But then Indianapolis did have Kurt Vonnegut. When I started reading his novels after I left Indianapolis it struck me how much Indianapolis culture was woven into them that I recognized. Little known fact. Minnesota is actually more German than Scandanavian in heritage population. You would not know that in the land of lefse, lutefisk, Sven and Ole jokes, Fargo, and Garrison Kiellor's Lake Wobegone. Jeez, what IS this, the Chicago-Polish answer to poutine??! Yummmm-eeeey. Inspired by this thread, I picked up a light Polish contractor's breakfast at Andy's on Division this morning. For $5.50 I got ten fresh-as-a-daisy (thanks, Gary) potato pierogi, one of the most delicious cabbage dishes I have ever tried (sort of a half-soured kraut with lots of onions and carrots, not to mention tons of butter and what seemd to be chicken stock; I've had it before, though not this good, but don't know the name) and a massive, juicy, crisply-breaded, pounded flat pork cutlet. No gravy. In fact, I've never seen gravy applied to the fried things at Andy's. That is one heck of a take-out meal. Davydd wrote: And, of course, a lot of German breweries that Indianapolis never had. Speaking in my lifetime. I remember no breweries on desirable hometown brews from the day I bought my first six pack in a bar at the age of 14 circa 1960. That's another story. When I got to Cincinnati there were plenty of breweries still going strong. When you Bears fans come up for a Viking game you might want to enter the lair of a former Viking and enjoy a Minnesota breaded pork tenderloin sandwich that can hold its own with some of the best in the Heartland. We drove down to Benchwarmer Bob's restaurant in Burnsville, MN to try their breaded pork tenderloin sandwiches. Benchwarmer Bob is Bob Lurtsema, former Minnesota Viking defensive lineman. He played way back when but who remembers and who cares because he warmed the bench playing behind a very fine front four. Benchwarmer Bob made more of a name for himself as an advertising pitch man on TV than playing football. The restaurant is half sports bar and half dining room with TV screens all around for watching the Vikings. But this time it was the Minnesota Gophers being thumped by Ohio State 44 to zip. The tenderloin was billed as a 6 oz. tenderloin with choice of fries, cole slaw, etc. for $9.99. The price was a bit on the high side as far as tenderloins go. It was surprisingly good. The breading was excellent with a faint tangy spice. The meat was tender and thick, and it spilled over the bun as it should. It is right up at the top for a Minnesota tenderloin and was reminiscent in presentation to what you get in Indiana sports bars. It came with pickles, lettuce, tomato, onion and a side of mayo. Mustard was not offered so I tried the mayo. With the Minnetonka Drive In closing for the winter season, this place and The Nook in St. Paul would be the two places I would recommend right now. Last edited by Davydd on November 19th, 2006, 6:17 pm, edited 1 time in total. Nice looking spread, nice photo! What's the brew--hefeweizen? The brew was Leinenkugel's Honey Weiss on tap. Leinie's is always good for supplying scale to a pork tenderloin so you can judge size as you will see in this next. Last night we went to Tony Jaros River Garden on the corner of Marshall and Lowery in Nordeast Minneapolis. Tony Jaros is basically a neighborhood bar with a long bar with booths across on the wall and a few tables. The "river garden" in the dark looked like a clump of weeds, trees and brush at the end of the parking lot overlooking the Mississippi River. 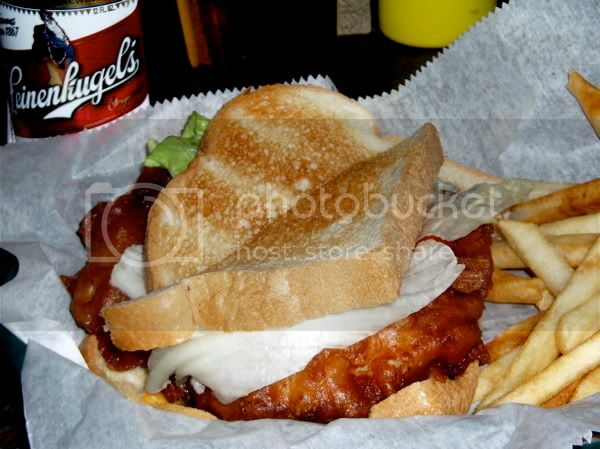 The menu said the Minneapolis StarTribune declared the breaded pork tenderloin the best sandwich on the menu. It was OK but it was not the best tenderloin I've had. The tenderloin seemed more battered than breaded. It was served with toast and the Deluxe was served with cheese, lettuce, tomato, onion and Mayo. It came in a plastic basket and was sliced in half. It was not overly huge. The meat was moist and tasty. Toast and battered seems to be a Minneapolis centric thing. Sully's in Nordeast was similar. Service was prompt and courteous. Tony Jaros was a cash only bar accepting no checks or credit cards. Fortunately I had cash and there was an ATM machine just inside the door. The Big Game, the Michigan Ohio State game was on the TVs but they promptly switched to the beginning of a Minnesota Gophers Wisconsin Badgers hockey game before the football game ended. It was that kind of crowd. Nordeast is an industrial area of factories, shops, warehouses and modest blue collar homes not too different that I knew growing up in West Indianapolis and would be the Minneapolis equivalent to South Chicago. The atmosphere was neighborly and unfortunately not my neighborhood to become a regular with it being nearly 30 miles away from my home. Last edited by Davydd on November 19th, 2006, 6:06 pm, edited 2 times in total. Do you mind editing in addresses and phone numbers of these very interesting locations? While I encourage everyone to do it all the time, it is especially important for out of town locations. I once went to the wrong location of a sandwich shop, which I later learned was the tourist destination with the 'real' location somewhere else. Thanks for keep us up to date on the stellar pork tenderloin sandwiches! Done. I didn't add St. Olaf Tap. You can't get lost there and you will need a map to find the town anyway. Much obliged, sir! Much obliged! As Iowa goes, so goes the..., er, I mean, it's just off the main drag (Interstate 80). * FWIW, in 2004 the Iowa Pork Producers Assoc. proclaimed that Darrell's Place served the best breaded pork tenderloin sandwich in the state. I have been craving that sandwich! It was very good. Chicagoans can get to a Machine Shed Restaurant in Rockford, IL easy enough.